Tomorrow begins Rosh Hashana, the Jewish New Year. We’ll be spending the next two days in temple, praying, but also eating. It has been said that the Jewish Holidays tend to revolve around food (either feasting or fasting). To some degree, this is true. Rosh Hashana’s traditional foods include a challah bread (round instead of the usual straight line) with raisins, some form of “new” fruit (pomegranates are a favorite), teiglach (a crunchy dough boiled in honey) and, of course, apples and honey. 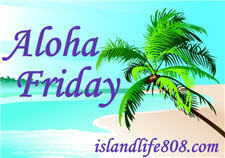 My Aloha Friday question is: Do you have any food related traditions? Bonus Aloha Friday Question: Have you ever eaten apples & honey? If not, try it! If you have, have some more anyway! Here’s wishing everyone a sweet year! There are some food traditions at Christmastime. I’m half Swedish, and meatballs and pastries are a way of life. Every year my mom and aunt bake all day, for days, to prepare a feast for everyone. I love challah bread. Aloha and take care. We do! We always have cheese dip while decorating our Christmas tree and chili on Christmas Eve! I know there are others, but those are the first that come to mind. Yes, definitely. Um, every occasion. Christmas, Thanksgiving, Halloween, birthdays. Even the special times I spend in one-on-one time with my kids. Food is VERY important. We always eat Mochi on New Year’s Day for good luck. It’s a Japanese tradition. We have my mom’s out-of-this-world crescent rolls on Christmas morning. They’re filled with marzipan and chocolate and almonds and a tiny bit of orange rind…covered in an orange glaze. Oh, I wish it was December already. On New Year’s Eve we eat posole (my dad grew up in New Mexico) and have a shrimp tray, though I never really understood the reason behind the shrimp. Tasty, though! We are trying to start a Fondue on New Year’s Eve tradition which we started last year so hopefully it will stick because we had an awesome New Year’s Eve. Oh yes, all the Jewish ones and we just love Latkes. Every year my daughter and I sing and dance while making them. she wouldn’t let the first day of Chanukiah go by with out them. .-= AuntieE´s last blog ..Aloha Friday – Music =-. We enjoy fondoue on New Years eve, but other than that no. Apples and honey sounds great…I will have to see what the kids think! I miss my mom’s pies at Christmas. That was always a tradition in our family; she lives far away and we haven’t been able to afford to visit. I had the opportunity to participate in a Jewish seder in college. I really enjoyed it! .-= Shelly´s last blog ..Aloha Friday: Desk Inspiration =-. We don’t really have any food traditions, but I know that if I don’t bring both cheesy potatoes and cheesy broccoli to Easter, Thanksgiving, and Christmas dinners, I will have a mutiny on my hands! LOL. Oh…and Great Aunt Margie always makes deviled eggs for Easter. Wait, I guess you could consider those traditions. LOL. Food related tradiations….chicken on Friday nights, matzo ball soup tonight. We even have a round challah for tonight. Yep, we have several food/holiday traditions. Shana Tova!! I’ve never had it but now I want to try it! .-= blueviolet´s last blog ..Wendy’s Heisman Scholarship Info & $20 Wendy’s Gift Card Giveaway =-. Not really, other than the usual holiday ones. I have never tried apples and honey, sounds interesting. I have had apples and peanut butter, very good! .-= Mrs. Marine´s last blog ..Aloha Friday #2 =-. Every year at Thanksgiving my Grandmother makes me my own Coconut Cream Pie (she makes one for everyone else…but there is always one there for me to take home!! I have tried apples and honey…love them!! Late Aloha! !